Digital Photography Tutor was a successful eBook showing new digital photography users how to use Adobe Photoshop, Adobe Photoshop Elements, or similar photo enhancement programs on their home computers. 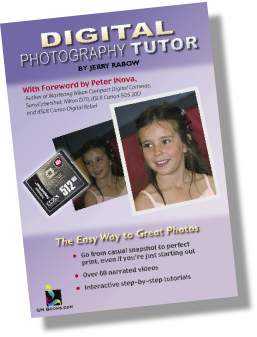 The eBook included interactive tutorials and videos to help users improve their digital camera images for home printing. Unfortunately, Digital Photography Tutor is now sold out, and rapid developments in the field make it impractical to bring out an updated version at this time. My website for digital photography still has some helpful tips and techniques at www.DigitalPhotographyTutor.com. I hope someday to be able to develop it again into an active site for digital photography enthusiasts.